I'm a bit late in getting to this one, but thanks to the NRDC for passing along news of their new website Building Green From Principle to Practice. This great resource contains tons of information not only on the whys and hows of green building, but also on the business case for building sustainably. 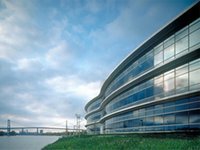 This new online resource details the benefits that both commercial builders and corporate owner-occupants can achieve with environmentally friendly design and building techniques. The site also identifies key opportunities in the areas of site selection, water efficiency, energy savings, resource use and improving indoor environmental quality. And the site provides tips on how a project can obtain certification from the U.S. Green Building Council's LEED (Leadership in Energy and Environmental Design) green building rating system. "Because buildings consume nearly 50 percent of the energy in the United States, green building presents an enormous opportunity to cut global warming emissions, while also saving money for owners and occupants," says Ashok Gupta, director of NRDC's air and energy program. The Building Green website includes case studies (www.nrdc.org/buildinggreen/casestudies/) of companies that have lowered water and energy costs with the use of green building technologies and achieved higher occupancy rates and rents by marketing their green features. Extensive links supplement the site's in-depth information with additional case studies, life cycle analysis tools and resources for identifying environmentally sound building materials. Items like this factsheet on the costs of green building make a compelling case -- let's hope this site builds some buzz in the business community! This is also a great resource for combatting those myths about environmentalism being "anti-capitalist."